Free and open access to high temporal and high spatial resolution Copernicus’ Earth observation (EO) data is becoming a major game-changer in EO sector, delivering new OPPORTUNITIES as well as new CHALLENGES at the same time. How to ingest enormous amounts of data (BIG-DATA), how to unlock the hidden value of the data and how to deliver new value to end user community, remain unanswered questions up to date. The project partners already embarked this mission before the PerceptiveSentinel project (alone or in partnership) and are considering this project as a logical continuation of their existent efforts, alignment with the PerceptiveSentinel project just being a welcome and advantageous circumstance. EO-Toolset, world’s first EO intermediate platform. The project has received funding from the European Union’s Horizon 2020 Programme as part of the Community Research and Development Information Service Programme. Coordinator of the project is Sinergise Ltd, Slovenia. PerceptiveSentinel is approaching this challenge by employing Cloud computing, delivering Cloud software solution and using commercial underlying Cloud storage and processing infrastructure. PerceptiveSentinel project will eliminate the problem of non-existing historical data and at the same time address global climate trends through development of STREAMING TIME-SERIES MACHINE LEARNING capabilities = introducing INCREMENTAL learning models where models are capable of adapting on-the-run, incrementally increasing knowledge and immediately putting it to use. Current wide-accepted perception considers EO as something designed by experts for experts. PerceptiveSentinel project is determined to challenge existent stereotypes by REDUCING COMPLEXITY of EO processing chain construction while at the same time providing HIGH ADDED VALUE of newly developed services. PerceptiveSentinel project will deliver revolutionary intermediate service that will combine: (1) automatic ingestion capabilities (SENTINEL-1, SENTINEL-2, SENTINEL-3, LANDSAT, MODIS, ENVISAT, Planet, RapidEye, etc. ), (2) high level of ingest data pre-processing (Level-2 and Level-3), (3) advanced data modelling techniques and (4) user-friendly graphical interfaces for CONSTRUCTION OF EO PROCESSING CHAINS. PerceptiveSentinel project will deliver interactive tools to support transition of EO processing chains into EO Value Added Services (EO VAS) = PUBLISHING OF SERVICES = exposure towards end-user community. Published services will be CONSUMED in two different ways, either directly consumed by end-user, using PerceptiveSentinel‘s FRONT-OFFICE services or either through CHAINING into 3rd party front-offices. PerceptiveSentinel project is introducing OPEN-VALUE-CHAIN business model: delivering first value-sharing and benefit-sharing EO platform in the world. 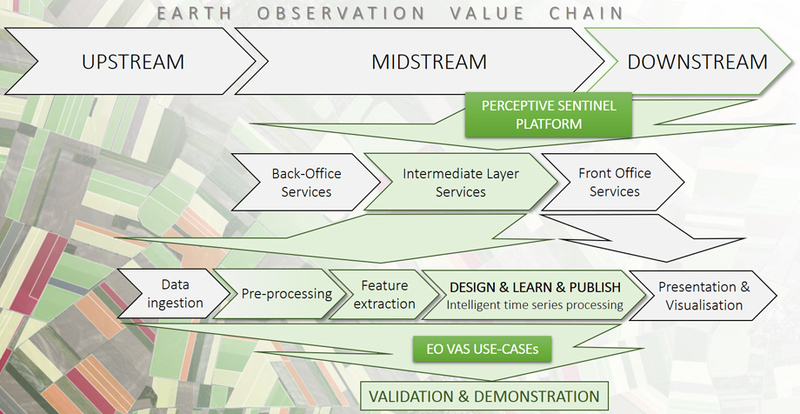 Innovative business model is based on COOPERATIVE VALUE CREATION and EXPLOITATION, including all participants of EO value chain: data providers, algorithm providers, service developers, service providers and end-users. PerceptiveSentinel project is built around new business opportunity arising from open and free access to Sentinel data, and availability of expertise, know-how and set of existing solutions by all project partners. Project partners have, during last 10-15 years, developed own solutions and commercial products, cooperated in numerous research and development projects, thus forming a comprehensive foundation for PerceptiveSentinel project. PerceptiveSentinel project, in its essence, is a business-driven project. The main business goal is to generate revenues by selling intermediate services through (1) our own or (2) 3rd party front-office services to a wide market population – reaching as many users as possible. 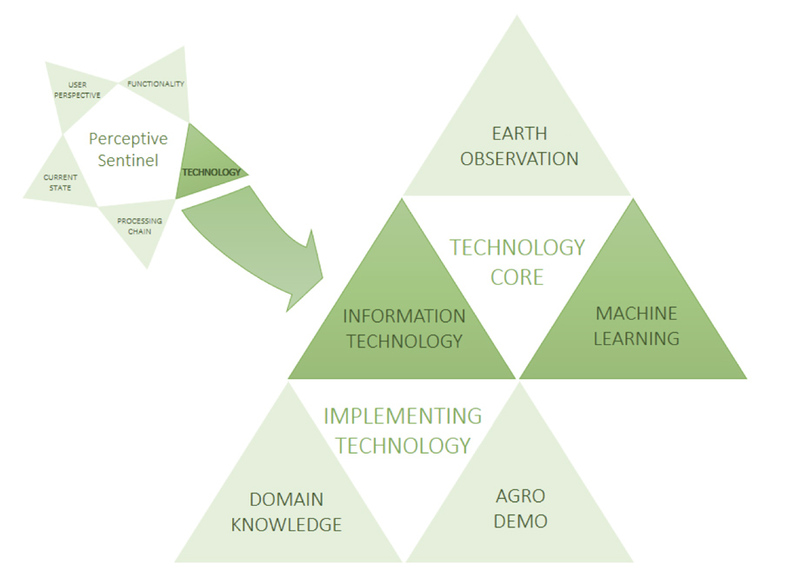 An OPEN-VALUE-CHAIN approach was adopted for PerceptiveSentinel platform to attract wide expert and non-expert user community and bridge the gap between information technology, earth observation and different end-user-domain sectors. The advantage of the open-value-chain approach is embodied in profit sharing, tangible or not, where the ADDED VALUE CHAIN is opened for 3rd party contributors, enabling them to harvest the fruits of their contributions. Data ingestion will introduce new “big data” gateways, delivering added-value through extensive data pre-processing, all of it invisible to user. 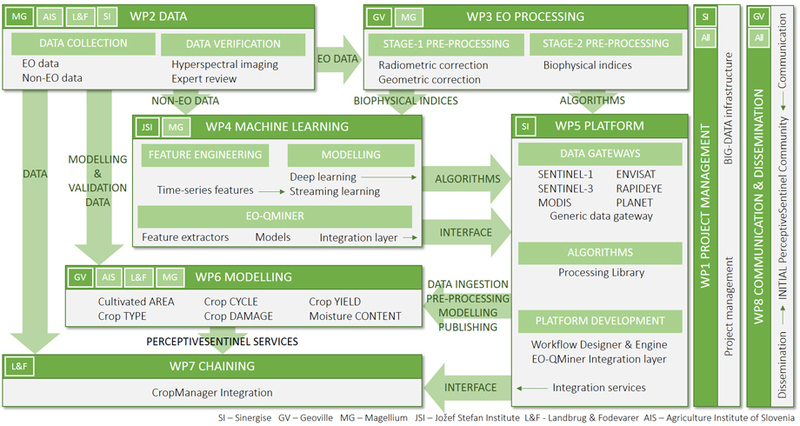 Design of processing chains will be supported through Workflow Designer (developed in EO-Toolset); The “heart” of PerceptiveSentinel platform processing capabilities will be contained in processing algorithms (functions/procedures) included in Processing library and machine learning algorithms included in EO-QMiner. Both upgrades will be hidden to users, since processing capabilities will be accessed through pre-existing Workflow Designer - graphical user interface that will be used to organize predefined and configurable processing modules (= algorithm encapsulation) into structured workflow processes (EO processing chains). Four types of modules will be supported: input, output, labelling and processing modules. Information technology can be considered as a main enabler of the project, solving BIG DATA challenge and supporting all other disciplines to achieve their goals. Streaming machine learning represents a core intelligence of the PerceptiveSentinel platform, providing feature extraction, knowledge extraction and knowledge re-creation algorithms. Earth observation technology provides main data input into the project and data pre-processing algorithms. Specific domain knowledge (pedologic, agriculture, insurance …) and agriculture demonstration will be used to validate and demonstrate added-value generating capabilities of main project deliveries. PerceptiveSentinel project is going to deliver a new multi-spectral, multi-temporal, data-fusion interpretation engine, building its unique features on streaming machine learning algorithms and high-level data pre-processing - PerceptiveSentinel platform’s processing chain will deliver new approach to data pre-processing – no operational system of this sophistication can be found anywhere in the world. PerceptiveSentinel platform will support full data cycle, from data ingestion to advanced ingest processing, knowledge extraction and knowledge re-creation. Data activities are aimed into delivering comprehensive and consistent data sets to be used as an entry into machine learning and model testing activities. Data will be first analysed from the perspectives of: availability, type of data, type of data access and relevance. After the first set of data will be collected, a comprehensive verification will be performed to verify its representatives (using comparison against other sources of data – hyperspectral imaging and employing expert domain knowledge). Last stage will be dedicated into forming independent sets of learning and testing data, which will serve as an entry into feature extracting procedures and model testing activities. Machine learning activities will be oriented into: (1) analysis of already implemented QMiner’s methods (delivering a candidate list of machine learning methods to be used in the project), (2) feature engineering (analysis of input data – see previous paragraph, and design of new features to be used in time-series processing) (3) modelling activities (using features to experiment with different machine learning models, analysing results and selecting most perspective models to be implemented into EO-QMiner). EO processing activities will deliver a final set of EO-data pre-processing and processing algorithms to be implemented into PerceptiveSentinel platform. Research part of programming activities will be dedicated into the research of all available OpenSource solutions with the goal to identify already existent algorithms to be integrated into PerceptiveSentinel platform. Integration with Landbrug & Fodevarer’s precision farming platform CropManager, as part of demonstration activities. TESTING AND VALIDATION activities are aimed into validation of newly developed PerceptiveSentinel’s intermediate services and into exploring their feasibility through the development of EO VAS services. For the purpose of PerceptiveSentinel’s validation activities, testing through AGRICULTURE applications was chosen. Agriculture is only one of potential domains for PerceptiveSentinel’s intermediate services – PerceptiveSentinel platform will not be domain-constrained. Testing and validation activities can be at the same time considered as a RESEARCH activity too. Our commitment is not just to validate software integrity of PerceptiveSentinel platform but also to prove that platform can also be used to deliver new knowledge. Newly developed EO VAS should therefore at the same time represent also a RESEARCH achievement in the field of agriculture. Eight work packages (WPs) are planned in the project. Two WPs, Project management and support and Communication and dissemination are horizontal WPs, spanning through entire project, while the remaining six are dedicated into delivering project results. Main project’s delivery will be PerceptiveSentinel platform - HYPER-SCALABLE, GENERAL-PURPOSE, DATA-INGESTING, STREAMING MACHINE-LEARNING platform. Streaming machine learning will be provided through platform’s “intelligence” component: EO-QMiner. PerceptiveSentinel platform will be validated and its value demonstrated through development of the first set of six EO VAS: EO VAS use-cases and through their chaining into Danish precision farming system: Demonstration USE-CASE. PerceptiveSentinel platform will be seamlessly connected with Copernicus’ midstream component (also with other providers of EO data: LANDSAT, MODIS, ENVISAT, Planet, RapidEye, etc. ), primarily exploiting free and open access to Sentinel data. PerceptiveSentinel platform will focus to the development of Intermediate Services which will enable intermediate users to exploit Back Office Resources, design and publish their own Front Office Services and further chain their EO VAS. Easy entry into the sector will be enabled, since new entrants will not be constrained by the requirement to develop their own ANALYTICAL, PROCESING and STORAGE capabilities. Platforms capabilities will enable direct market entry, platform acting in a role of VIRTUAL MARKETPLACE. Access to data and access to EO VAS DESIGN services will be FREE-OF-CHARGE. Commercial exploitation will be charged in a form of service fee or revenue sharing.